The ideal work environment varies from office to office. For some companies, bean bag chairs and plenty of snacks work to enhance the 9-5 experience. Others may prefer a more structured arrangement–complete with defined seating arrangements and built-in privacy. From arranging special furniture to selecting the perfect paint colors, here are a few tips to help you nail the ideal work environment for your business. Does your current office design promote collaboration or is it hard to get people away from their desks and talking to one another? These days, modern offices are increasingly moving toward an open plan. The idea is, you’ll break down cubicle walls in favor of more flexible seating that encourages people to engage with one another, rather than being siloed off in their little area. So how do you create this ideal work environment within your office? Well, the secret lies in the furniture. Consider setting up bench-like work areas or skipping assigned seating for a work space that feels more like your favorite library or cafe. The flip side of the collaboration trend is, sometimes you do need some cordoned off space to meet and discuss more private matters. Should you opt for an open plan, consider setting up other offices where people can hold meetings or have a moment of quiet reflection. The ideal work environment should inspire creativity, not block great ideas from making their way down the pipeline. We’ve all been in drab offices that do little more than slow down the passage of time, yet, over-the-top clutter and crazy colors can be jarring or distracting when you’re trying to think. Color can make you happy or more depressed, motivated or lazy. You don’t want to stress out your staff. Seek out calming colors like green and blue for best results. Green promotes harmony and creativity, while blue offers trust, along with a soothing clarity. But, if this all sounds a bit boring–consider adding pops of color here and there. Say, a yellow wall to increase the flow of ideas or red accents to inspire passion and excitement. Even different rooms can have different colors according to their intended use. Flexibility is huge in today’s workplace. Modular units, adjustable standing desks, and wheels, wheels, wheels—all are essential in working together to create a space that works how you need it to. If your office demands a certain level of flexibility, you may want to consider making the move toward minimalism. Think–laptops employees can easily move around and work spaces kept clean and clear. If it’s a lot of work to move furniture around, you won’t actually do it, after all. Got a vision in mind? At Work Space Solutions, we’re all about helping you create a climate where you and your employees can thrive. Contact us today, and we’ll help you find the right furniture–whether that’s bouncy balls or benches–to enable success. Here’s a not so fun fact for you: too much sitting is known as the new smoking. That’s exactly how dangerous sitting for long periods of time can be on your body. If you’re currently working in a position that requires you to sit for extended periods, you may be harming your body more than you think. You may think that sitting for prolonged amounts of time may not be as dangerous as a physical job, but you’d be thinking wrong. Sitting in your office chair all day can really mess with your body in a lot of different ways. We’ll take you through the most damaging. No matter how comfortable your desk chair is, it is still preventing you from stretching out your spine enough throughout the day. You may find yourself slouching, creating a strain on your neck and spine which can lead to more damaging back problems. The nerves of your spine may also be affected, leading to excruciating back pain. Sitting too long can also put a lot of pressure on your muscles, leaving you in pain at the end of your work day. Yes, sitting at work all day without doing a lot of moving will put you at risk for heart disease. Sitting too often has been linked to higher levels of cholesterol and blood pressure. Studies show that those who sit who long periods of time are at a 14% increased risk of heart disease as opposed to their nonsitting counterparts. This may be a no-brainer. If you are sitting all day, chances are you aren’t getting a lot of exercises. Even if you are heading to the gym right after work. Your average workday is 8 hours, which means that’s most of your day that you’re sitting. As you’re sitting, your muscles immediately quit working as much. This means that your metabolism slows, your insulin drops, and you may find yourself searching for snacks in the break room. So how can you prevent the above-mentioned issues? Start using a stand-up desk so you can stand up throughout your shift if you choose. Take frequent breaks. Use this time to get up and stretch or walk around the office. Grab some water or coffee. Getting up to grab a drink can also get your blood flowing. Use up your lunch or break times for taking small walks with coworkers. You can chat with your work buddy while also getting in some much-needed steps in. Working eight hours a day can be stressful enough but knowing that your sitting job may be harming your health can add to that stress. Make sure that you’re taking precautions while at work. Take some steps while at work, or invest in a standing desk. These measures will benefit your health greatly. Have you recently transitioned to a standing desk? Let us know how it is improving your health. Well, 2016 is officially over and 2017 is already off to a great start! In order to provide our customers with the latest and greatest productivity-maximizing technology, Workspace Solutions is always at the forefront of the ever-changing world of office design. Because of that, we’ve put together a roundup of the top 4 office trends you can expect to see in 2017! One of the biggest trends that we’re seeing more and more of each year is the inclusion of all varieties of technology in the workplace. As technology keeps rapidly improving and shifting, we can expect our workstations to complement and support our devices. For example, wireless cell phone chargers have been and will continue to be incredibly popular in the workplace. It’s entirely within the realm of possibilities that the near future will see a boom in charging docks integrated right into the desktop or workstation. The past few years have seen a substantial (and much needed) interest in employee well-being. As studies continue to show links between heart disease and the sedentary lifestyle common with office jobs, offices are taking an active approach to taking care of their employee’s well beings. Not only does this mean safer, more ergonomic furniture, but we can also expect to see an increase in the popularity wellness-centered office furniture, including standing-height desk adjustable-height desks. Along with the physical wellbeing of employees, companies are also becoming more aware of their employees mental and psychological wellbeing as well. One way companies are attempting to improve workplace morale is by integrating more natural elements in their office design. A popular trend we’ve seen in offices is bringing the outside in. This doesn’t just mean having a few more plants around, but companies are beginning to use natural themes in their design plans. This ranges from using reclaimed wood, to water features, natural lighting, and more. The utilization of natural elements can have amazing effects on your office’s morale, productivity, attitude, and overall happiness, just to name a few. Fortunately, the traditional “cubical farms” of old are on their way out the door. They’re being replaced my open-plan office designs and natural themes. Something crazy is currently happening in offices around the country – and that is the welcoming of Generation Z. 2017 and the next few years will be the first years Generation Z-er’s will be a part of the office culture, which is actually a really good thing. Generation Z has a different attitude when it comes to workplace productivity. With the imminent transition of Generation Y, we can expect to see traditional cubicles being replaced by open concept designs, which encourage collaboration, communication, and teamwork while improving office morale. One popular trend we’re seeing is a café-style seating system where employees can open their laptops wherever they like and set up camp there for the day. Studies have actually shown substantial evidence in support of a more mobile workstation. Not to mention, the amount of work-from-home employees is on the rise, which means it won’t be long until we see a further shift away from cubicles and desks in general. Workspace Solutions in Fort Wayne, Indiana has some of the latest and greatest office furniture options available. We have exactly what you need to bring your workspace into 2017! We also have experienced office designers on hand that can help you plan your next move or remodel! If you’re looking to improve your workplace productivity or utilize any of these new office design trends, give us a call today (260) 422-8529! 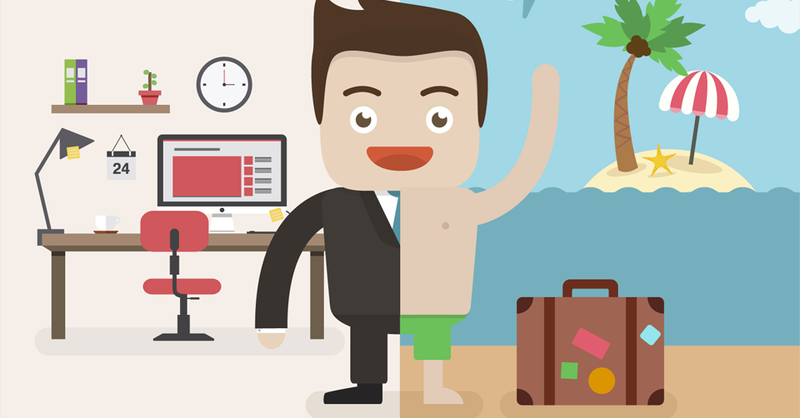 Did you know that over 50% of Americans don’t use their paid vacation time at work? For one reason or another, we’re hesitant about taking the time off that we’re entitled to! Not only are we entitled to it, but we desperately need it! The daily work grind can wear you down both physically and emotionally. As a result, you’re going to get burnt out, and the quality of work may begin to decline. If you haven’t taken a vacation in a while, now is the perfect time to do so! Here are eight things you can do before and after your vacation to ensure that you have a relaxing, stress-free week away! One thing that might hold you back from enjoying your time away is the work that you’re going to miss. The week before your vacation, take account of the important tasks that you’re going to miss the following week. If possible, work ahead and complete some of these tasks before going away. Studies show that 61% of Americans still work while on their vacation. This doesn’t make for a very relaxing vacation. Make sure your fellow employees, clients and bosses know that you will be out of the office. If not, they may try to contact you, and you will feel obligated to tend to any problems they might have. Even after you notify everyone who needs to know, chances are, someone will still attempt to contact you while you are gone. In order to minimize the risk of this happening, set up an auto-responder on your email letting people know that you will be out of the office, along with providing them with the contact information of someone else that would be able to help them. Don’t forget to change the outgoing message on your voicemail so people know that you’ll be out of the office. Many people fear going on vacation because they assume that no one else can do the work that they do. No matter how much work you do, just trust that your employees can handle the workload for a week. Since you’re going to be gone, make sure you delegate some of your responsibilities to other coworkers, so you know that your work is still getting done. The biggest reason that many people are hesitant about going on vacation is the anxiety brought on by the idea of a mountain of work upon their return. In order to make sure you are able to enjoy your vacation, plan ahead to reduce some of the work that will be waiting for you. Do as much as you can before you leave, and make sure that all loose ends are taken care of. Every business has a natural ebb and flow of busy periods. One way to make sure that your workload is minimized when you return is to plan your vacation around these busy seasons. For example, if summer is busy season for your workplace, then maybe it’s best to plan a vacation in the winter. On the bright side, travel and lodging prices usually go down during the off-season! Look at your calendar at what you will miss on vacation, and what you have going on upon your return. Make two checklists; one checklist of things you have to do before you leave and one checklist of high priority tasks you need to do on your first day back. Coming back from vacation will be much worse if you come back to a cluttered desk. Take some time to clean off your desk and organize your papers, so you can return from your vacation with a clean slate and minimum anxiety! After you finish all of these tasks, then you’re ready to hit the road for your stress free vacation! Have a great week, and we’ll see you when you get back! If you’re looking for high-quality used office furniture, now’s the time to buy! Join us for a used office furniture auction at our old location on Coliseum Blvd. Preview Friday the 20th, 10a-3p. A guide to some cool new office furniture options. It seems like each day, new office furniture is being crafted to better adapt to the ever-changing trends in businesses and offices. With each new product comes a greater degree of functionality and efficiency. It can be hard to keep up to date on all of these new products available. Fortunately, Workspace Solutions in Fort Wayne is here to help you learn about new products that are available in the world of office furniture. New from All-Steel is the Mimeo Office Chair – a chair designed with the best of both ergonomics and visual impact in mind. The unique design of the chair back helps to offer constant contact with the user for incomparable support and comfort. This chair is incredibly versatile, as it’s open design accommodates for a wide range of postures and uses. Each aspect of this office chair is designed to be incredibly visually appealing, and even customizable. Everything about this chair is customizable; from the color of the chair back and the base, or even armrests! 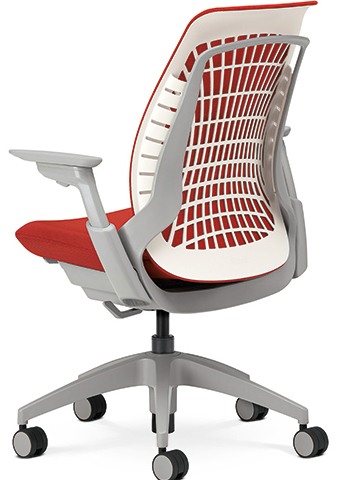 When it comes to ergonomics, the Mimeo chair allows the most lumbar support and comfort available. The unique design of the chair back allows every inch of your back to be supported at once. It just makes sense. New from Humanscale is the Trea chair. This revolutionary office chair was designed by New York designer Todd Bracher to be a solution to many workspace issues. It’s designed with a mechanism that automatically adjusts to the user’s body for up to 12 degrees of reclining positions, which helps the user to maintain a balanced posture while providing lumbar support. This is no regular office chair. The Trea is perfect for conference areas, cafeterias and home offices. The smooth yet subtle design of the Trea allows it to harmoniously complement its surroundings, rather than overtake them, offering a sleek, modern look. This new chair from Humanscale not only comes in a wide variety of finishes and color options, but its also available in three different base styles; four-leg, four star, and cantilever. 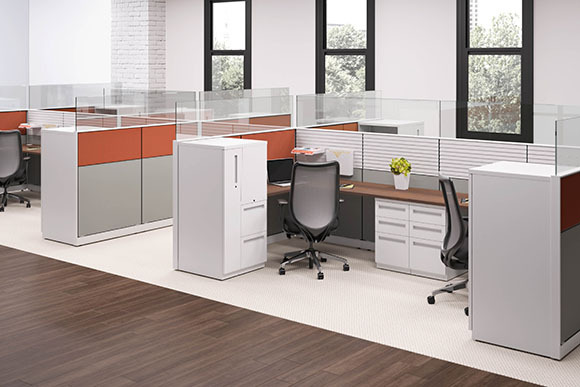 The new Abound workstation from Hon is a revolutionary new design that offers the best of both worlds, when it comes to cubicles. The trendy design of its frameless glass tiles offer immediate access to natural light, while also defining your personal space. It contains all of the benefits of cubicles, without any of the negative connotations. This workstation is incredibly flexible, and its ease of setup makes it surprisingly portable. With installation taking only minutes, your desk will be ready to use in no time at all. The Abound comes with interchangeable, flexible tiles to best fit the needs of any office space. With the interchangeable paneling, the Abound workstation is incredibly customizable. Easily swap out a fabric paneling for a markerboard or frameless glass paneling to best fit your needs. The best part of these great new office furniture options is that you can get any of them right here in Fort Wayne. At Workspace Solutions, we also offer custom office planning and design. Check out these great new office furniture pieces and many more in our new showroom that is conveniently located next to I-69 and US30 at 2208 Production Road. Here at Workspace Solutions, we’re proud to handle many fine lines of office chairs. Some, like La-Z-Boy are very well known, while others, like Gunlocke may be more famous for who’s used them. Every U.S. President from Woodrow Wilson to Jimmy Carter chose a Gunlocke chair for the Oval Office. Truly successful workspace solutions also deliver long-term satisfaction and ongoing performance. That means building for the customer’s needs, today as well as tomorrow. Not just anyone can make good on this promise. Delivering it requires a company that demands excellence at every level. Why settle for anything less than a furniture manufacturer who’s continually setting a higher standard on your behalf? Since the 1920’s, Gunlocke has stayed focused on everything an office client needs to succeed: design, functionality, delivery, quality and value. Back in the idyllic 1950’s, people in the suburbs used to visit one another by meeting along the back yard hedge. What if you could put a hedge in your office, you know, a place that encourages your staff to meet regularly to discuss and exchange ideas? Collaborative work settings are a vital part of contemporary office design. Ideas grow when shared, and ideas create the next profit centers within our businesses. Without ideas, it’s hard to move ahead or even keep up with our competition. Old office walls and cubicles made for privacy, but privacy keeps ideas from sprouting and taking root. How you design your office dictates how your employees will interact with customers, and each other, so it’s important to think of your office layout the same way you think about any technology you invest in to improve productivity and growth. Workspace Solutions has been designing collaborative offices for years. Now they have new tools from Allsteel to take your office to the next level. 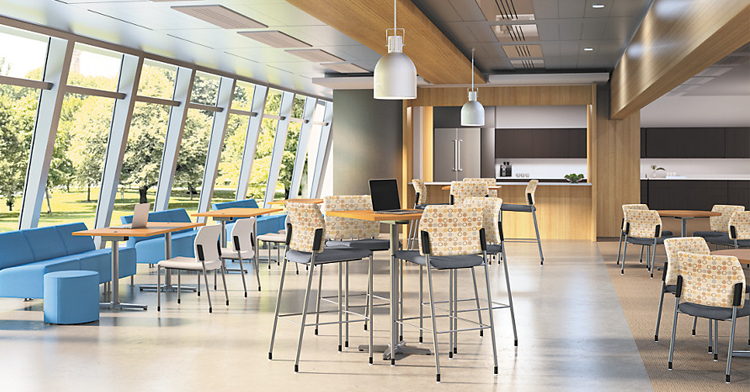 Allsteel has two new lines designed to increase employee collaboration: Gather, and Involve. Learn more here, or contact Workspace Solutions for a demonstration. Gather around the Hedge in your office, and get everyone Involved in the future or your business. Workspace Solutions is the Allsteel dealer for Northern Indiana, including South Bend, Elkhart, Warsaw, and Fort Wayne. Workspace Solutions can also serve you from their office in Indianapolis. Throughout the year, Workspace Solutions installs the latest office furniture into businesses all over Northeast Indiana, Indianapolis and South Bend. The furniture they replace then comes back to the Workspace Fort Wayne warehouse, located behind the Workspace Solutions location on Coliseum Boulevard, between Lake Avenue and State Road 930. Then, once a year, during October, Workspace opens up the warehouse doors to the general public, and offers a huge selection of used office furniture at incredible warehouse sale prices. Used lateral files start at $195.00. Mesh High back task chairs as low as $129.00 while supplies last. Files, desks, chairs, conference tables, storage units, and more. You’ll find it all inside the warehouse during Workspace Solutions annual October Warehouse Sale, through October 31, with sale items at both locations: 256 W Main Street in Downtown Fort Wayne, and their Warehouse showroom at 919 Coliseum Blvd. N in Fort Wayne. Check out more at our Warehouse Sale Website here. Now that the new season of “Mad Men,” the cable show that depicts the day to day personal and business activities of a New York advertising agency in the 1960’s, is back on the air, we begin to notice once again what it was like working in a large office a half century ago. One of the first things we see are the IBM Selectric typewriters instead of computers on every secretary’s desk. Next, we notice how segmented the office is. There are conference rooms, and large corner offices for the executives, each with a desk and secretary posted at the entrance. If we were able to plan this space today, it would appear quite different. Not only would the typewriters be gone, so would the desktop computer. In “Mad Men,” we often see the creative team working in a break or conference room, where they can stretch out, have room for their sketches and yellow pads, and collaborate with one another. That’s exactly what the modern office needs today, places that encourage collaboration, and allow workers room to access their I-pods, laptop, or tablet computers. Following another modern trend, the “Mad Men’s” conference room would most likely be empty most of the day, and at New York office rates, that’s a giant waste of space and money. As a collaboration space, the old conference room now draws together creative thinkers able to easily share ideas and create the next annoying commercials you will see on TV. Watching “Mad Men,” it’s amazing that they ever come up with any good ideas within a space that seems designed to hide and protect people and ideas from one another. If your office still resembles the fictional ad agency of Sterling Cooper Draper Pryce, you’re fully prepared to take on the 1960’s. If you want to take on the twenty first century, then it’s time to contact the office creators at Workspace Solutions.